The 25 Prismatic Lens Wall Bracket Light is available in 2’, 3’ and 4’ lengths in 1 and 2 lamp configurations in T8 only. 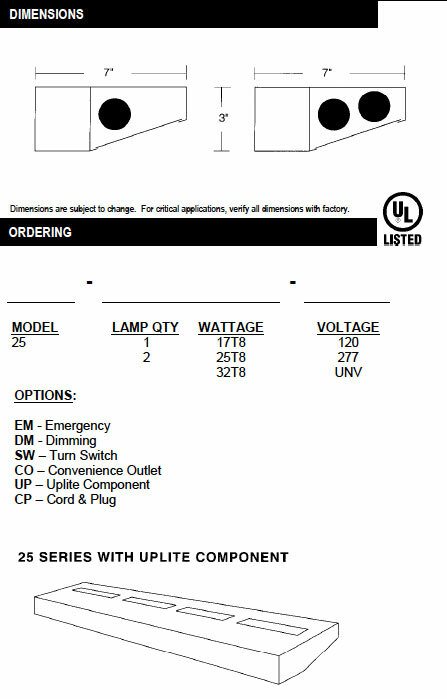 This is a versatile unit and can be wall-mounted, with or without optional uplight component, for task lighting or can be under-cabinet or corner-mounted. Optional switch, convenience outlet, and cord and plug assembly to meet any requirements. For individual and continuous row mounting. Heavy-gauge, die-formed steel housing and end plates. 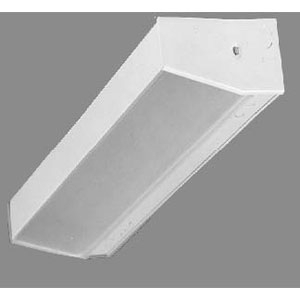 Clear Linear Prismatic snap-in diffuser for glare-free illumination. All parts are finished with high-gloss, baked white enamel with minimum 89% reflectance, applied over iron phosphate pretreatment, for maximum adhesion and rust resistance.